Sitting on the balcony of our hotel room this morning at the Portland Regency and contemplating a dilemma. I am an adventurous girl. Since I turned 45 ten years ago, I have zip lined multiple times, pedaled a recumbent bicycle in the treetops, parasailed several times, paddled a kayak and an outrigger canoe, and a few other things suitable to a chunky middle-aged girl with no athletic skills. But, that adventurous spirit does not include my palate and this brings me to the Maine dilemma. In the land of fresher than fresh seafood, I likely won’t eat any of it. Not a bite. Yesterday at the Maine Lobster Festival, my husband, Ed, ate a lobster roll. 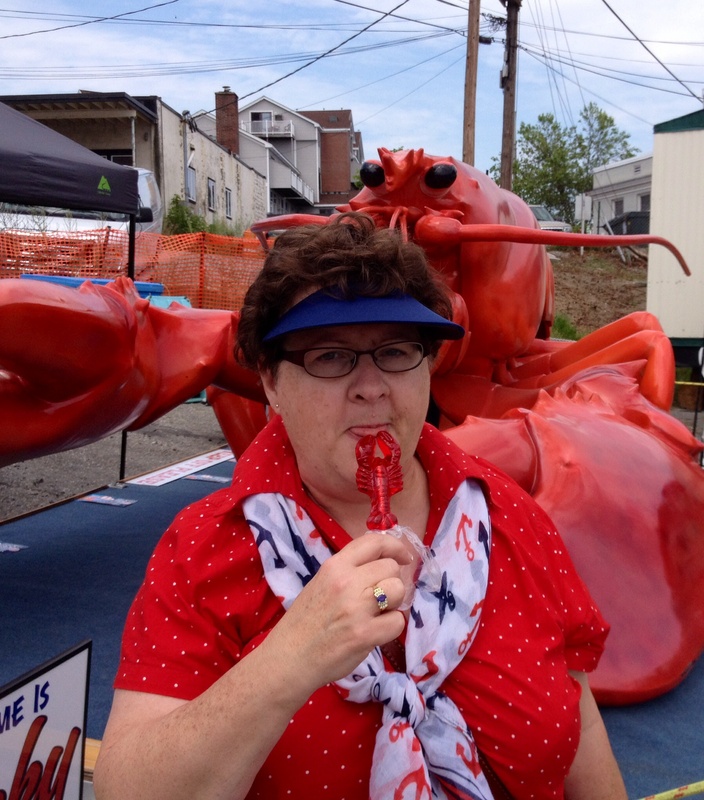 Check out the photo below and you will see that the only lobster that I consumed was a lollipop shaped like a lobster! A little hungry (remember, it was a LOBSTER festival) as we headed for the return train trip, I bought a “to go” order of corn chowder (read that again, CORN chowder). It looked absolutely delicious, brimming with chunks of corn, potato, and bacon! One bite in, I could taste the seafood. No full ingredient menu disclosure here. Here is my dilemma – should I, can I, try at least one bite of lobster while I am here in the lobster capital? Not a dilemma with the serious implications of those we will discuss in our sessions about publishing ethics. But, a dilemma for me because I like to identify as a person who will try new things, all except food that is. On one hand, I may never get back to Maine. I need to grab the brass ring. I am here. On the other hand, although my palate has expanded considerably since my childhood, I have very definite opinions about what I do and do not like. Eating something that I don’t like, frankly, makes me gag. It’s not like there’s not enough other good food – delicious food – in the world. I have already enjoyed fresh Maine blueberries several times, and I had a popover, a regional favorite, with my dinner. Furthermore, it can be said that all of my height goes side to side. Does a chunky, postmenopausal girl, who battles weight every day of her life, REALLY need to possibly cultivate a love for something one dips in butter to eat? Perhaps not! My Maine men, Marley and Longfellow (hopefully you met them in my first post), have already spoken. Marley (a moose) says, “Carpe diem, old girl! Dip that lobstah in that buttah and give ‘er a try!” Longfellow (a lobster) understandably dissents by noting, “You are clearly a true lover of all the creatures of the earth, Jackie. And, Maine blueberries in August are absolutely delicious, nutritious, and low in calories. Just saying…” Never mind the fact that I have already chowed down 2 steaks in Maine, obviously negating my status as a lover of all living earthly creatures, and one scoop of sinfully delicious blueberry ice cream, jeopardizing any possible calorie watching of yesterday! Alas, what’s a girl to do? As you see me around the conference, feel free to “weigh in” with your thoughts about my decision. P.S. If you share my dilemma, feel free to let me know that, too. We can support one another! This entry was posted in Uncategorized by Jackie Owens. Bookmark the permalink.